The entrance to a cave, unofficially called “Beware Cave,” is marked by an overhang under which springs emerge at the deepest part of Gandy Warm Springs and Warm Creek—almost 4 feet deep. 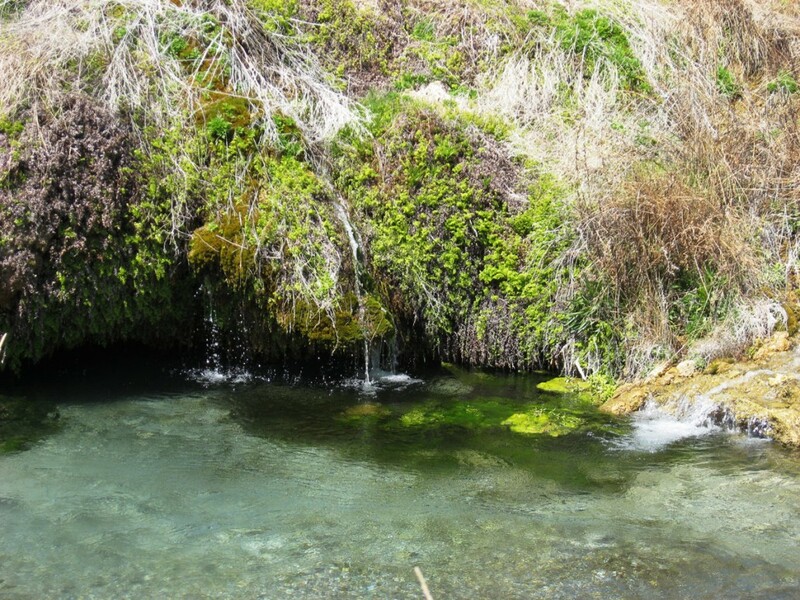 Gandy Warm Springs is a refreshing oasis of tiny waterfalls, pools, caves, and crystal clear streams with water temperatures up to 81˚F. 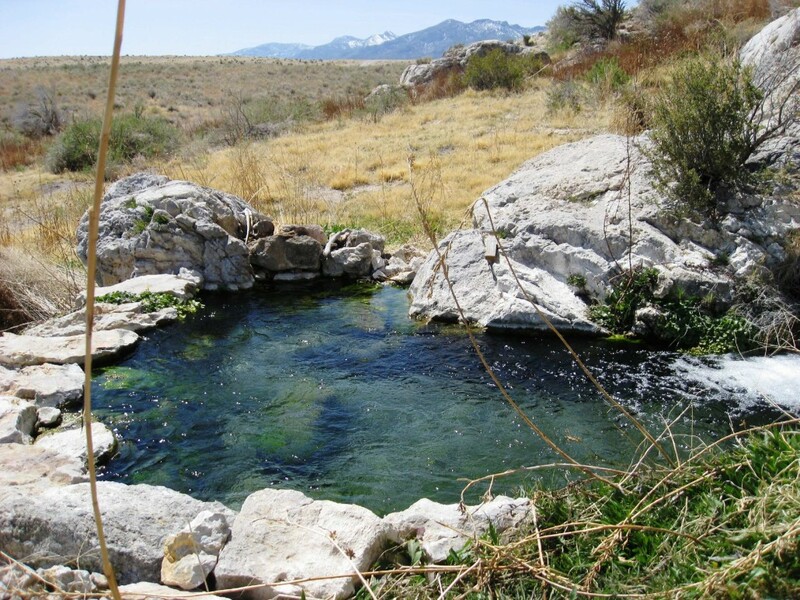 Located on the western edge of Snake Valley, near the Nevada border, the springs are at the base of the southern tip of Spring Mountain (also called Gandy Mountain). 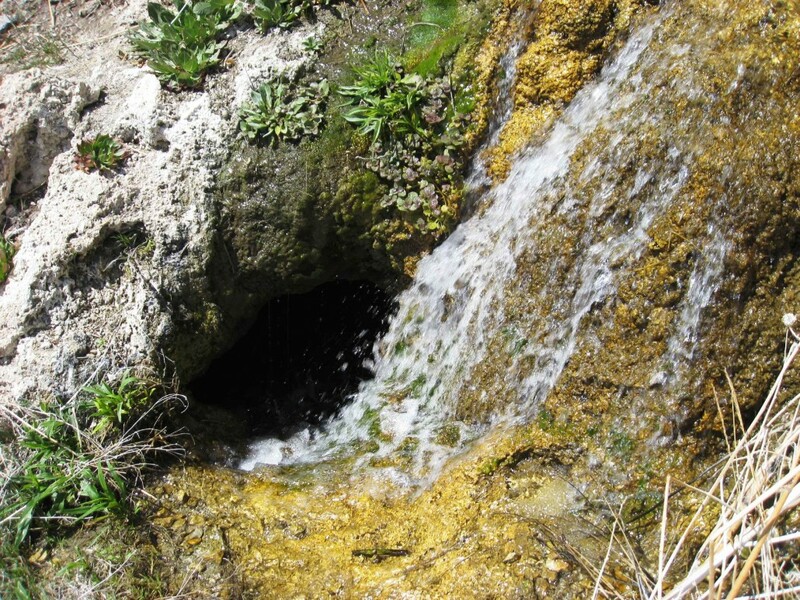 The spring water that cascades down the slope of Spring Mountain joins a larger spring that emerges from a cave, initiating the eastward-flowing Warm Creek (also called Gandy Creek). Lush green vegetation, including mosses, watercress, and bright green algae, and animals such as aquatic snails (including the endemic springsnail, Pyrgulopsis saxatilis, found only at Gandy) and the native speckled dace wonderfully stand in stark contrast to the surrounding dry yellow grasses and desert shrubs. Gandy is a popular spot for locals who use the area for soaking, swimming, and baptisms. Given the small size of Spring Mountain, a cluster of hills extending a mile north-to-south and rising just 1000 feet above the surrounding landscape, as well as the noticeably dry climate, one is amazed when considering the voluminous output of Gandy Warm Springs. Every minute, the springs discharge nearly 9000 gallons of water. In other words, Gandy Warm Springs can fill 20 Olympic-sized swimming pools every day. The source of water for Gandy Warm Springs is the northern Snake Range and perhaps locales farther west. Possible conduits to the surface for the warm water are faults located in Snake Valley. 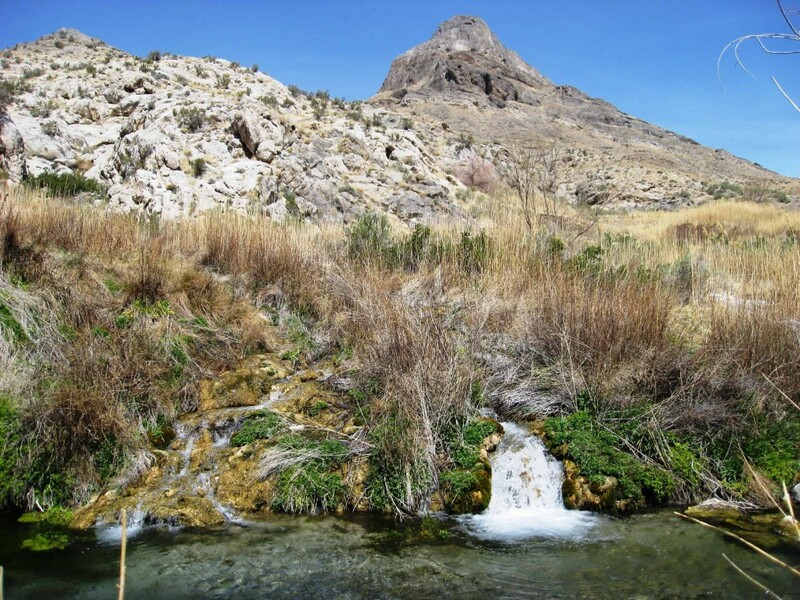 Alternatively, the springs could flow from sediments containing groundwater that is forced to the surface by the bedrock barrier of Spring Mountain. Passageways through limestone bedrock could also channel groundwater to Gandy. 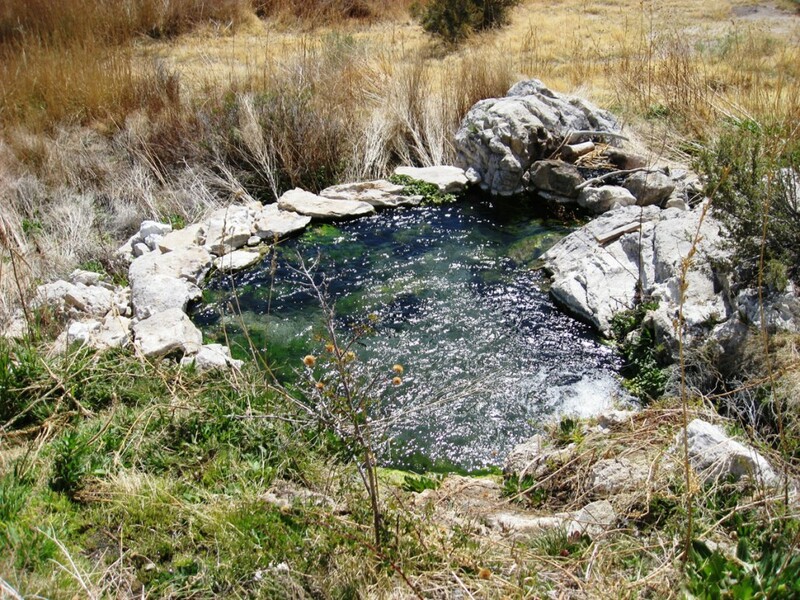 Chemical analysis of the spring water’s isotopes suggests some older regional groundwater thousands of years old mixing with more recently recharged groundwater. The rock of Spring Mountain is largely Ordovician to Cambrian-age Notch Peak Formation, a dark brownish-gray dolomite and gray limestone originally deposited on the seafloor about 500 million years ago. 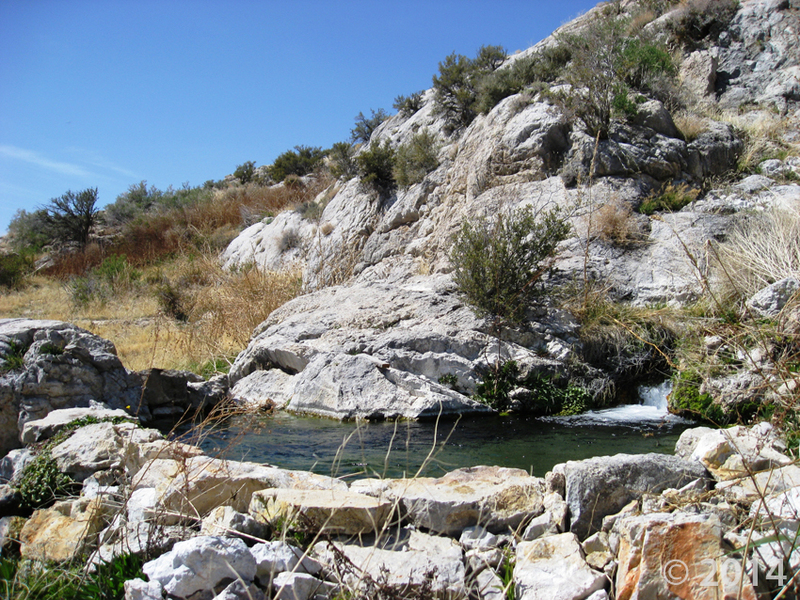 The springs flow from another limestone—the Cambrian-age Orr Formation. The limestones create intricate and intriguing topography (known as karst) characterized by cavities, alcoves, and caves; some of the spring-derived streams disappear into caves and reemerge down slope. A mile north of the springs is Crystal Ball Cave, which contains large, roundish, sparkly calcite crystals, called “nailhead spar” (thus the name Crystal Ball Cave) up to a foot thick on the cave walls, as well as stalactites and stalagmites, columns, and platforms that mark ancient groundwater levels. A large assemblage of Ice Age mammal bones have been collected from the cave (for example, saber-toothed cat, camel, “large-headed llama,” and musk ox). Discovered in 1956, the cave is privately owned through a mineral claim on Bureau of Land Management land. Gandy Warm Springs is remote, but not difficult to find. Heading west on U.S. Highway 50/6 from Delta toward the Nevada border and Great Basin National Park, turn right on Gandy Road, two-thirds of a mile before the border, and drive 28 miles north. At the sign for Gandy turn left (this turn is 100 feet before Warm Creek, a green ribbon of vegetation in the desert) and drive west, beginning along the south edge of a farm, for 2.7 miles. A good landmark for this turn is the Matterhornlike Spring Mountain a couple of miles to the west-northwest; you will want to end up at the southern end of the mountain. The road after this last turn is a little bumpy, but passable for all vehicles in dry weather. For the final few hundred yards the road loops around to the northeast, descending to the creek and ending at a turnabout and parking area. Gandy Warm Springs can also be accessed from the north, via the towns of Trout Creek and Partoun on the Snake Valley Road; however, distances from pavement and services are farther than by way of the southern route. There are no facilities near the springs. There is a gas station/motel/service station/restaurant (The Border Inn) at the state line on U.S. 50/6, about 30 miles south of Gandy, and the nearby town of Baker, Nevada. The next closest services are in Delta, Utah, about 120 miles east. Camping is an option in the vicinity of the springs, which is Bureau of Land Management land, and directly to the west of the springs, on Utah State Trust Lands.